Effectively operating a compressed air system — especially for more than a single application — requires that operators maintain a pulse on critical performance indicators, including speed, load size, air pressure, and the rate of air flow. The latter two measurements, air pressure and flow rate, are measured in relation to one another using two distinct metrics: PSI and CFM. What is the difference between the two and what is the nature of the relationship between pressure and rate of flow within a compressed air system? Pounds per square inch (PSI) is the metric for assessing how many pounds of pressure are exerted on a single square inch of space — 100 psi equates to 100 pounds of force exerted per square inch. The air gauge on an industrial compressor typically displays PSI within the compressed air system. Cubic feet per minute (CFM) is a measure of volume used to indicate an air compressor’s output rate in terms of cubic feet of air per minute of operation. CFM is measures at a given PSI and increases in direct proportion to the horsepower (HP) that is applied. While small, mobile at-home air compressors may deliver around 2 CFM, industrial air compressors with 200 HP can achieve air flow of around 1,000 CFM at 100 PSI. Ensuring the successful execution of any application requires supplying the respective application with sufficient air flow (CFM) at the correct pressure (PSI). To do so effectively, air compressor operators must understand the relationship between CFM and PSI. (where P1 is the initial pressure, V1 is the initial volume, P2 and V2 are final pressure and final volume, respectively), gas pressure increases in inverse relation to the volume of its container. 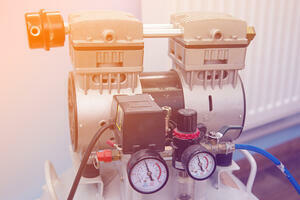 A plant has a 25-HP compressor rated at 100 CFM at 100 PSI. However, they can only maintain 80 PSI in the production area. How much more compressor HP does the plant need to maintain the required 100 PSI in the plant header? In this example, supplementing the existing compressor with a 7.5-HP compressor could effectively add volume and stabilize discharge pressure to the desired degree. Since it can be difficult to gauge the appropriate amount of pressure required for a given application, many operators err on the side of overpressurization, ramping up PSI to ensure enough pressure is achieved. However, overpressurization, also known as artificial demand, can create unrecoverable cost and energy losses (keeping in mind that in general, for every 2 PSI increase in discharge pressure, required energy increases by 1%). Identifying critical pressure requires experiential knowledge of the given application and understanding of how to read pressure regulators installed on production equipment. Many industrial applications require only 75 PSI, yet operators tend to run compressor systems between 100 to 125 PSI, resulting in artificial demand rates of up to 40%. Accounting for unpredictable pressure drops that may occur across dryers and filtration systems, most operators can afford to scale back pressure by up to 25 PSI. Regardless of your specific compressed air applications, ensuring you maintain an accurate pulse on both pressure and flow rate is critical to ensuring the proper functioning of your pneumatically powered applications. What’s more, mitigating artificial demand by keeping pressure and flow rates within close range of critical levels can keep costs and energy usage low as well as maximize the service life of your compressed air system. If you have any questions about the pressure or flow rate required for a given application, consult your distributor.